But now that I am a little more relaxed with leaving the back door open for her to go out into the garden, I realised that I need to keep a more regular House Collar on her with some ID. Are martingales more effective and securer than a regular collar (like the one above?) And are they secure both ways - ie when the leash is in front of them over their head as well as behind them over their back? Are there particular benefits or reasons to prefer a harness? Do you keep house collars on all the time? For example, keep the house collar on and add the walking collar/martingale/harness. Are regular collars ok for jogging with a dog or would it be better to go for a harness? Can martingales/harnesses/regular collars be used as the House collar too? At the moment, Im considering the Bark and Giggle Comfort fit (http://www.barkandgiggleboutique.com/comfortfitharness.html), a House Collar (http://www.silverpeacock.co.uk/collar_single.htm) AND a Martingale (http://www.silverpeacock.co.uk/collar_mart.htm)... too much? We keep a house collar on Koni all the time, it looks like the one that you linked above. When we are visiting someone with no backyard and have to go to the bathroom on leash, we just clip on to his house collar. When we are walking, though, we use a front-clip harness (the leash attaches in front and it is hard for the dog to pull) because Koni is still learning good leash behavior. The packaging for our harness said that it was not supposed to be used for jogging because it can chafe, but I that is what I use (we just do very short bursts of jogging while on walks so I'm not worried about chafing). I would look for a jogging-specific harness because jogging with him on collar makes me uncomfortable. He still trips and falls sometimes or tangles in my feet and I would be afraid of hurting him before I could get myself stopped. Conker's got four different things. One is his tag collar that has his tags on it. He doesn't wear it inside the apartment but he does when we go outside for longer than 10 minutes. The leash is never attached to this collar. Second is his step-in harness. We use this one when we know we aren't going to be going out a lot that day. It's easier to take off. Third is his regular harness. He'll wear this one on days when he'll be going out a lot and it stays on him all day. Fourth is a martingale collar. I only use this when he's really tired, and he's never been able to slip it. It works no matter where it is located if it's adjusted correctly. I use harnesses because Conker will launch himself at random times, plus it's easier to pick him up when he's wearing one. I don't want him to injure himself so it's a safety thing. I'm working on getting him to stop that but I won't use the martingale all the time until he is consistently better about that. For jogging, running and hiking I'd probably use a harness until my Shiba doesn't react to things. When using the martingale, he has his tag collar on as well. The tag collar is almost always able to slip off so it's loose and doesn't get in the way of the martingale. I plan on getting additional tags for all his accessories since he doesn't always have the tag collar on and reserve that one for his license and rabies. I'd go with whatever you are comfortable with. If you feel your Shiba won't lunge or get tangled up, use a martingale. If not, use a harness until she is better about reacting to things. Jazz wears her harness all the time (well, except when it's naked dog time). She has an i.d. tag attached to it. In addition, when we go out, she wears a collar that has the full info - microchip information, regular tag, and rabies tag. I have quite a few collars, harnesses, and leashes so I change them out pretty regularly. I find that B&G's comfort chafes less than others - I believe it's because of the fabric, versus some of the nylon that is out there. I've never used a martingale with her. Katsu has a house collar, but we have not been using it recently. Once his dog tag comes in, I imagine it'll stay on him most of the time. For walks we use the Easy Walk harness which has helped significantly with his leash pulling. We take it off when he's indoors. We also have a martingale, but we haven't used it yet since the harness has worked to our satisfaction. Some people say they wouldn't leave a martingale on a dog because it presents additional choking hazard. If I do end up using the martingale, I would probably not use it in the house and reserve it for walking outside. I wouldnot leave a matringale on indoors, but from what I've heard they're the collar a shiba is least likely to escape from when used correctly. Sorry to post in an old thread - I'm thinking about getting Yuki a martingale collar and had some questions. I like this site that I found posted in another thread somewhere: http://www.barkandgiggleboutique.com/ I know they're currently closed as they move so size/price information seems to be unavailable. Are there any comfort/effectiveness differences between the original martingale and the chain one on that site? For those who use one, does it really work at keeping them from slipping out, even if they try to jerk backwards out of it if startled (assuming it's fitted correctly of course)? Is there a site you got yours from that you really liked? What size did you get for your Shiba's? She makes great products. Those I purchased were all cotton (no chain), with a satin lining. They are beautiful and are designed well for Shibas. Another seller who also has Shibas, is K9 Couture. I have some very well made cotton puppy martingales from her. I use a chain Martingale from Foxy and Lola for my boy. He's really good at slipping out of collars, and step in harnesses. I have yet to have that happen with a Martingale. My boy has a large neck due to fluff so I went with the medium since he outgrew the smaller ones. I'm not sure about the difference between cloth and chain, but I figure a chain may tighten quicker, which is a must for my boy since he can buck, and knows the trick about facing you and pulling back with a twist. @ Inoushi: Before when I could fit roughly 4 fingers in her harness, she would do this play-bow position and stretch her front legs out and bring her head down between her front legs and yank back. In this position, her elbows were basically completely parallel with her chest and she slipped out. I just *knew* when we first got the harness she wasn't really being calm and good - she was just busy figuring out how to get out. Now I have the harness pretty tight and that move doesn't seem to work anymore (I hope). Right now I am just using a extra small kong collar for my young pup. He will jump and play around on it and what not, but he won't walk on it. He will sit down and pull and shake his head. But I am going to wait a little while until hes a bit bigger so he won't outgrow it so fast. I'm so sorry to post in SUCH an old thread! Rika, if she is pulling and you are not using a front clip harness, that is the better way to go. A martingale is great, but you don't want to use it for pulling issues as it will, like a flat collar, still create pressure on their neck. I use martingales, I love them, but if pulling is the issue I recommend a front clip harness at least until the pulling is minimal. Also if you are using a retractable leash, I would get rid of that as that too encourages always pulling as the dog is always at the end of the leash. Once the pulling issue is taken care of, yes, a martingale is a good collar IMO for walking in normal conditions. @redcattoo, thanks for your opinion! So the front clip harnesses work well? I'm just worried that Rika will actually TURN AROUND, yank at it and refuse to walk, *turn around in front, shake shake shake, yank!!! * Or will front clip fix that problem as well? I use the front clip harness for my young mixed boy who is up to 52 lbs now. It works very well as the one we have clips on easy with two buckle clips, one for the strap over the back and one for the strap under the chest. What happens is if they pull too hard or lunge they will get turned towards you which relieves the pulling pressure and gives you opportunity to refocus them. With my first boy who can very easily slip out of collars, the martingale worked well when sized correctly to reduce his ability to pull out of his collar, but it does put pressure on his neck if he pulls or lunges. Actually, last night in the rain when I tool the boys out they got rambunctious on their leashes and before I could get them both calm and refocused Bear slipped his collar and martingale ending up off leash with no id's (other than he is chipped) ... we did end up getting him back safely, but it does make my heart stop. Now this particular martingale isn't perfectly sized in that it doesn't close down as tight as possible as it is a little big for him, plus add the rain, thin coat in summer, and two hyper wrestling dogs I had a lot going against me. Today actually, for the first time we put a harness on Bear instead of the martingale and he walked just fine with the front clip. Then again he usually walks okay with the martingale even though he still likes to walk at the end of leash with a gentle pull type pressure. I only have issues when his prey or play drive kicks in and then the martingale isn't ideal as not only does it mean he pulls with pressure on his neck, but he has managed to slip martingales as no matter what his neck is just bigger than his head and I don't want to over tighten the martingale either (hence why I don't use a choke collar of any kind). The other thing you can do is be very diligent about teaching loose leash walking. Anytime they are about to get to end of leash give them a "oh oh" stop and until they return to your side and release the pulling pressure you just stand in place. This has to be done each and every time you walk the dog to assure consistency and understanding. This means if you are in a hurry to go somewhere, pick them up, don't let them walk on leash until they have master the loose leash walking art. I would go to Petsmart (http://www.petsmart.com/product/index.jsp?productId=2751027&amp;lmdn=Brand&amp;f=PAD/psNotAvailInUS/No) and buy the front clip harness (it is by Premire -- called the easy walk harness) to find out how it fits, how your pup takes to it, and see how it works. If you like it, get on Amazon and order one (they are much cheaper) then when you get it return your other one to Petsmart. If you are using a regular harness with a ring on the front, it will work the same way as a front-clip no-pull harness and not alter the dog's gait in a negative way. The reason why Shibas need these particular collars is because the Shiba's neck diameter is very close to his head diameter...and then he only has small “up and forward” ears…the result?....regular buckle collars slip right up and off!!! Shibas seem to have perfected the art of backing right out of their collars; they even turn their heads and tuck their ears! With martingale collars, however, I know that my dog is safe and secure. I know that she will never slip out of her collar. Martingale collars are often called "Mushers Collars" since sledding dogs (which are usually Spitz breeds) often wear them. Another name for them is: “Limited Slip Collars” - because they are technically "slip" collars ("slip" is the technical word for "choke") in that they tighten when a firm hold is required...but the "slip" or "choke" aspect is limited so that these collars never tighten more than the diameter of the dog's neck - they can never choke a dog or damage his throat. Note: Do not use martingale/limited slip collars that use chain instead of a loop or length of cloth material. The chain presents more dangerous pieces that can catch on things or get caught on teeth, but more than that, the chain also leaves a horrible stain on the beautiful cream colored “uraijiro” on the neck and cheeks of a Shiba Inu...a stain so permanent that only harsh chemical cleaners/laundry pre-treaters can remove it!! Harnesses are ill-suited for almost every puppy of every breed. They should be reserved for working dogs whose work calls for them (and even working dogs start out on collars - using collars until they’re trained well enough to walk on a harness). A harness is for workind, tracking, or pulling. It gives GREAT POWER to the dog. You have no control when you put a harness on a dog. A dog will naturally learn to pull hard when wearing one. Allow him to feel the sensation of muscles being supported by the harness and bingo he’ll pull! You will create a hard leash puller simply by using a harness to go for a walk! You will also give your dog total control of the direction and speed and tone of the walk when you use a harness. The worst behaved dog in training class will be the one in a harness! My girl only wears a Martingale with her ID on it and the harness is only used a a seat belt in the car to keep her safe. The idea that a harness will create a puller is absolute nonsense. My dog has been on a harness since the day we brought him home and the only times he pulls are when he's (1) trying to chase a rabbit or (2) being babysat/at daycare and he sees either my husband or I. He doesn't even consistently pull for #1. The way you keep a dog from pulling is by training them not to, period. Same thing for staying "in control" on a walk. They're pulling? Stop walking. They want to go left and you want to go right? Tough crap, walk right (my own dog knows to look for what direction I'm going when I tell him "this way"). And collars can be dangerous for some dogs. I will never walk mine on a collar because even the slightest pressure from a collar makes him gag. Honestly, any dog who will pull sometimes is probably ill-suited to a collar. It's bad for their neck. I don't think badly of those who walk their dogs on collars. It can work fine for some dogs, but I can say that no dog I own will ever be walked on one. Harnesses work just fine and will never hurt their necks, so I really don't see the point. It probably is a good idea to practice loose leash training along with the correct equipment for the dog at hand. I have had good luck with http://www.freedomnopullharness.com/ I like this product since it allows for multiple options and switching around as the dog progresses in its training. No need to purchase multiple harnesses. I use a regular martinagale collar with FNPH and clip the harness on the back, distributing the pull tension between that and the collar with two leashes. If the dog is very strong puller then you have the option to switch one to the front as situation dictates. I also like the fact that the harness unclips on the sides to be stepped into and one can order a smaller width for a smaller bodied dog. Good luck and use a combo of training along with equipment. Equipment alone usually does not solve all loose leash walking issues. I think this is ill informed. Each dog, each owner, each environment presents a different set of needs. The right harness the right training and you won't have a puller. It is obvious you also have no idea how a front clip harness works as that type of harness discourages and does not allow for pulling. I agree martingales are great for Shibas, but mainly for those who are disciplined enough to walk mostly loose leash. For along time the only thing I used for my first Shiba was a martingale, but they have limits and yes, if a dog pulls, even with "limited slip" undue pressure is created on their neck and can cause damage. Additionally, as a dog pulls more scar tissues build up in the neck resulting in them feeling the pull less and thereby pulling more a vicious cycle. As @StaticNfuzz noted you should always with any collar or harness also work on and teach loose leash walking. With that though if you have a puller the front clip harness is a great device and I will tell you with my 52 lb mixed boy it has been a life saver over the martingale during early training. A 52 lb boy suddenly lunging at a gecko, rabbit, bird is very difficult to counter for a 120lb 5'4" woman and a huge strain on the dogs neck at the same time when they are pulling vs a front clip harness that automatically redirects them back towards me and relives the pressure. I just recently started using a martingale for our shorter walks. It works well with a standard 6ft. lead. For longer walks and hikes, I use a webmaster harness, and typically a longer or retractable lead. I have had limited pulling issues with both. As stated before, proper loose leash training is important, more so than the collar/harness itself. I used to walk my Sibe, exclusively, on harness, and with the proper training, had limited pulling issues. Martingale's with chain aren't necessarily a problem. I wouldn't leave one on a dog all the time, but they're fine. I've never had a dog get stuck in the chain part. Some chains, if left on all the time, will stain the fur. some will not. A quick bath gets rid of it. It doesn't stain forever. I walk my nonpulling Shiba on a martingale collar with a chain, but he wears his leather buckle collar as well because he wears it all the time (it's his ID collar). For my pullers, I don't use collars for walking for the reasons others have noted. Somewhere around here I know there are linked articles about the way any collar can do damage to the trachea, so for pullers, collars are a bad idea. Bottom line is different dogs need different solutions, and even among good harnesses, the fit may be different for different dogs. I had to really try a bunch before I found one that worked for our Akita. Btw, I already tried a martingale on Rika, but it has a chain. She is quite good on it, with some occasional pulling. I'm trying to stop her from pulling, and she also seems to realize that pulling is NOT SO comfortable on a martingale compared to a harness. I hope I'm careful enough not to hurt her trachea. I've been leaving the chain martingale on Rika since I put it on, because she is mainly supervised, or sleeping. The chain hasn't been damaging her fur yet. But I think I will take it off when I leave the house for a long time, and will probably also invest in an all fabric one at the same time. P. S. I've also been training her to stop pulling. Can anyone advice me on a Julius K9 Harness? I have bought two size mini for my shiba's which are both 60cm around chest, but somehow I find a size mini look so small.. I've also seen some french bulldogs wearing a size mini. The size of a mini is 51 - 67 cm and for 7 - 15 kg and a size 0 is 58 - 76 cm 14 - 25 kg but I was afraid the size 0 would be too big for when they loose weight. Kenta is around 9 kg and Kitsu 14, did I make the right decision? @Kenta - We can not advise you whether or not they are the right size without actually seeing them (in person) on the dog. If you physically have them, have you tried them on Kenta and Kitsu? If so, did they fit? No, I forgot to mention I ordered them online, sorry. 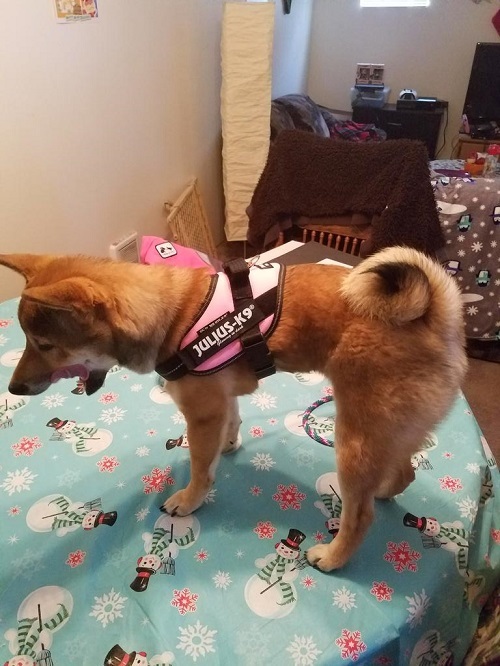 I was just hoping there would be some other Shiba's here having that harness, so I can compare and know what size fit best on Shiba standard, since I could only find a french bulldog wearing the same size and a french bulldog and shiba's are pretty different measurements so that is why I was asking. So this is a 3/4" wide collar - I got it in Purple and the embroidered name in Lavender with a paw print after her name. I requested a martingale sized at 14" to 16" and even though it's heavier, I decided to get the stainless steel buckle in addition to the stainless steel slider tag. It looks really nice, the nylon is a nice, strong material. This collar will definitely be with us for a long time. This ended up costing me $30.99 - shipping was free! I am VERY happy with my purchase and received it within 10 days of ordering. 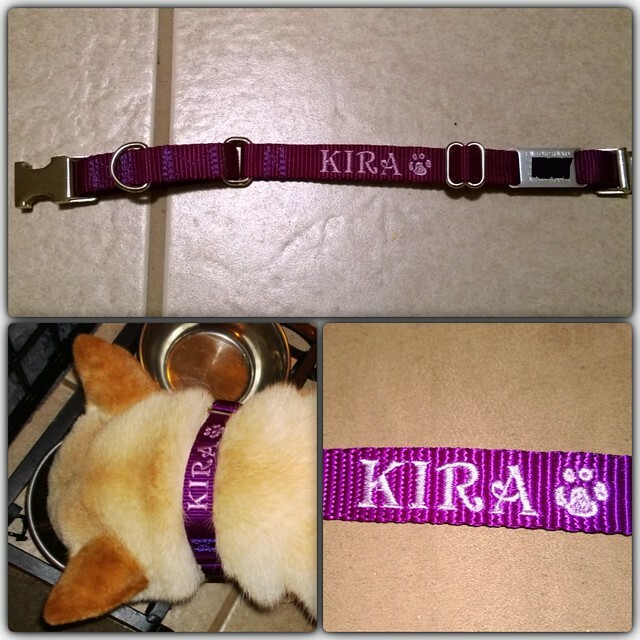 I emailed them after I placed the order because Kira's collar size was between the 10-15 inch and the 16-20 inch. I received a quick response and they offered to make the collar 14-16 so that she would have growing room if necessary. It's beautiful! I HIGHLY recommend you try one if you like the boomerang slider tags, want a martingale collar, and would like to have your dog's name embroidered on the collar! Oh, here it is too! Ok, I commented in the other thread, but I'll repeat here. Thanks for the info! And how soft is the material? Is it stiff, or more flexible? Thanks! (And I don't even need a martingale for my Akitas--ie. the big headed NKs!--but I do need them for my Shiba and Kai Ken). The collar is flexible over stiff, for sure! I think that you would be happy with it if you tried one out for your babies! I was on the fence on the width - got 3/4" instead of an inch but since Kira is petite, it's perfect for her! It's similar to a ruffwear harness in some ways, but it looks easier to get off and on, and I like the way it sits on the front. Somewhat cheaper than a webmaster, too, and I like that you can add (small) saddle bags for an additional price. I'm thinking of trying it out. They are super easy on and off, but I suspect a determined dog could get out of one, though mine have never tried. I would just get another in a bigger size for my growing Akita, but I'm kind of interested in the Julius harness as something like the ruffwear webmaster, but a little different. I like the Comfort Flex and use those for Flyball and Agility, and for walking my calm older dogs. A frisky or spooky dog could slip them tho. The Julius harnesses I see used a lot in Agility also, but I don't care for them as much. @shibamistress - I have used a similar harness to the Julius (made by Dean & Tyler). They did not really work that great for the Shibas and Nola was able to squirm out of it. However, for larger dogs that are less likely to back out of a harness it will probably work really well. That being said, I really like the Webmaster because of the support it gives the pups if I have to lift them (and I end up having to lift Nola a lot because of her medical issues). I have Julius K9 IDC harness for Koji and I use it when we are out and about and need a easy harness to put on. He also has ComfortFlex Sports Harness, but that is used for Nosework only. Julius K9 IDC harness is used by a MANY agility competitors to bring their dogs into the ring, but it is always a hassle for me to take it on and off when I am in an agility ring and am nervous. I like the simple design and that it has reflective lines on the harness, so making it visible in the dark. I couldn't comment on how useful it is to prevent a dog from backing out of it as none of my dogs do that and I never see any agility dogs at a trial doing that either. 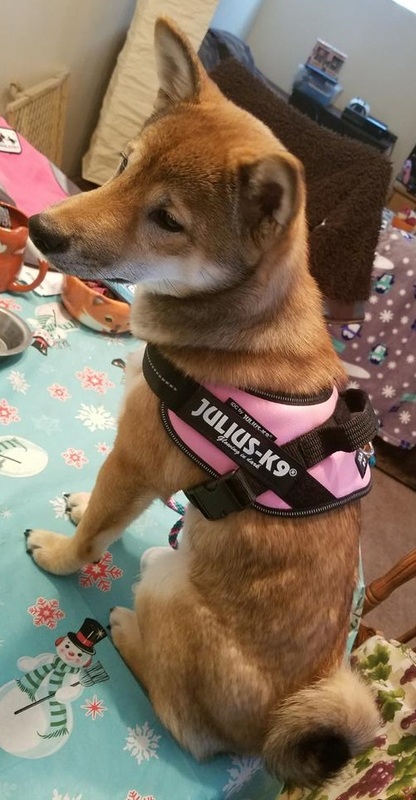 I just got Asuka a Julius K9 IDC Powerharness and I am wondering if any of you have had any issues with your Shiba pulling out of this harness or any issues with the front being a velcro closure. This harness seems much more comfortable for her and I am dying to get her outside with it. However...I am concerned about her breaking free. 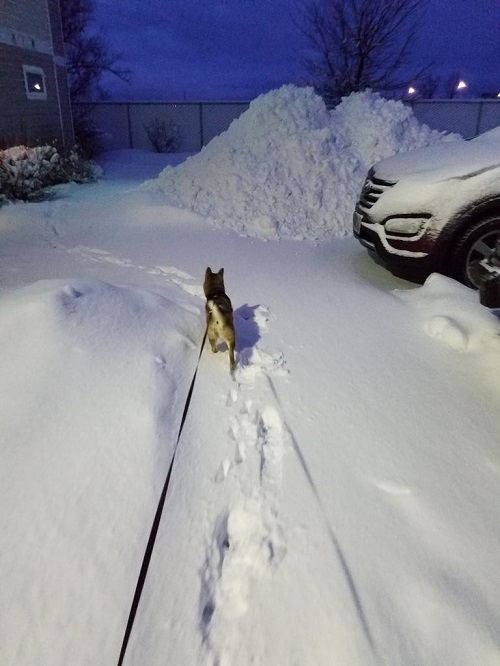 We have a lot of snow currently and she loves to go jumping in it. She broke free once and that was enough for me lol. @Mosh - the Julius k9 IDC is one of my favorite harnesses, and I have like 15+ harnesses lolol. The Velcro has held up just fine despite even being in the water and snow. Ozzy isn't really an escape artist though, so if you're worried about her spazzing and backing out of the harness, there are definitely harnesses that are more escape proof, like the ruffwear webmaster. But as far as easy to put on harnesses with plenty of functionality and utility, I looove the Julius k9. It's held up perfectly for me, in rain, snow, swimming in some streams even. @Mosh One of my favs, too, for Laika. So long as you have it fitted well she shouldn't escape unless she's super slippery. What size of the julius K9 fits adult shiba? Size 0? Am i supposed to get the mini for my 4month poopy? Size mini is what I have, and it's about at its smallest setting. Ozzy is 20 lbs and about 19 inches around his girth. I also have 2 of the Julius k9 belt harnesses, and the size mini is too big for him. I occasionally use the size mini-mini of that style, but it has like no room to grow and the velcro strap in front of the shoulders is loose on both of the belt style. I definitely prefer the IDC power harness to the belt harness style. They might be more intended for dogs with a wider stance or something though. Ozzy's shoulders seem pretty narrow and angular ha. 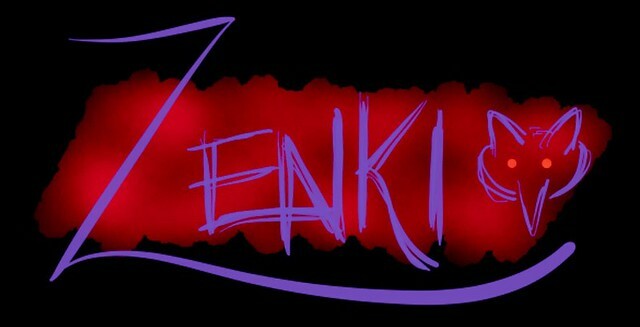 @zenki the one on Asuka in the picture is a size mini. Shes currently 14lbs (7 months old) if that helps. @nickdressen I measured Asuka last night and her chest is 18in and her neck is 12in. At the smallest the straps go its not loose. I would assume this mini would fit an adult male shiba...thoughts? Do you know his weight? Maybe you could use something like yarn to measure the width of his girth and then measure the yarn with a ruler (or phone app equivalent) lol. I think the mini would likely fit, depending on how close to standard size he is. :) Ozzy weighs about 20 lbs (9kg) and the mini fits him great, and has lots of room to expand if ever needed. If I get a martingale collar...does it need to have a buckle? I was looking to get one from Knine couture. @Mosh, depends on your preference... or the dog's! ;) Typically Shibas don't like things going over their heads, so a buckle can be useful. K-nine Couture can add a buckle to most designs via etsy [etsy link]. The ones in their web shop with "Combo" in the name are already buckle martingales [shop link]. @zandrame She currently has a buckle collar that is 3/4in and it cuts her hair in 2 and drives me nuts. It looks terrible and she itches like crazy. I was looking to get a 1in collar. If a buckle doesn't matter I'd rather not get one cause it's bulky, but I wasn't sure. The collars are expensive enough lol.